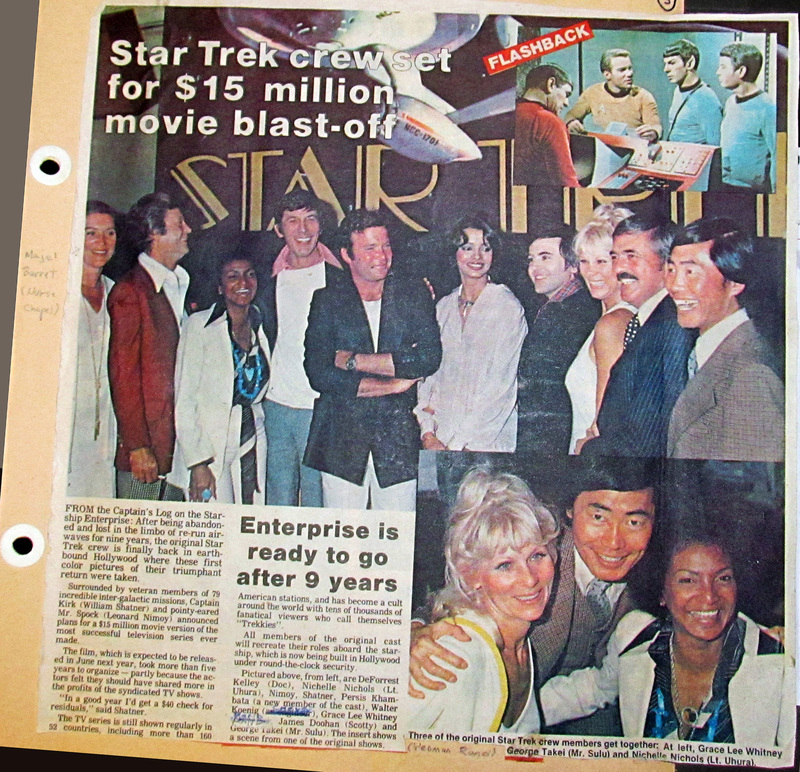 Here’s today’s Flashback: From March 28, 1978, an article (from all things) The Star tabloid — a real full color article on the launch of the Trek movie (a feature less common then than it is now). You can see the estimate for the movie was 15 million dollars, I believe when it was all finished it came to something like 40 million (but I’ll have to check my facts). 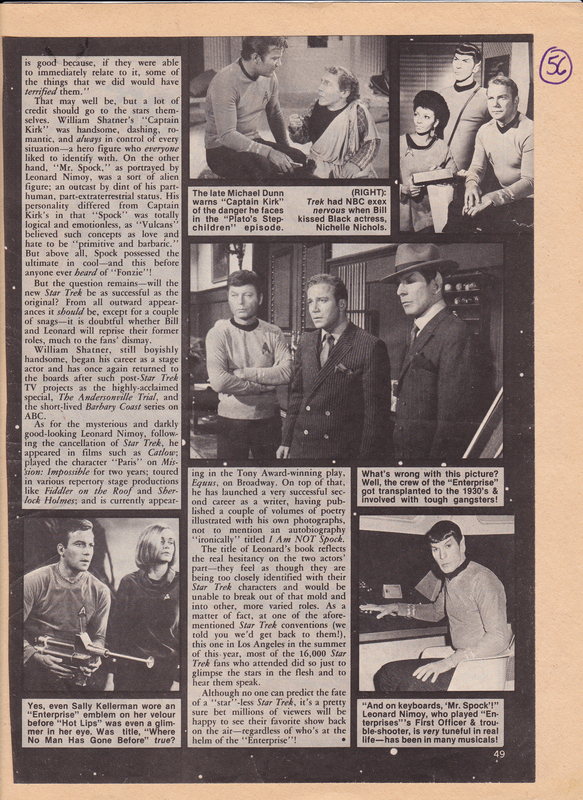 You’ll note that as ever the picky Trekkie, I was always on top of clerical errors in these old articles, here noting that Grace Lee Whitney was mis-identified as Christine Chapel, even as the real Chapel, Majel Barrett is standing at left in big picture, you can see my teenage scrawl identifying her in the margin, as well as the mis-caption of the lower right hand pic, and cross outs of other mistakes involving Waler Koenig and Grace. And the flashback is naturally backward too! Oh these Trek amateurs! At least Grace looks ecstatic, probably hoping that this would bring back some good work. I always liked Grace, a crime she was screwed over in the original production because Gene wanted Kirk to have more space babes! Here’s today’s flashback: A four page (!) 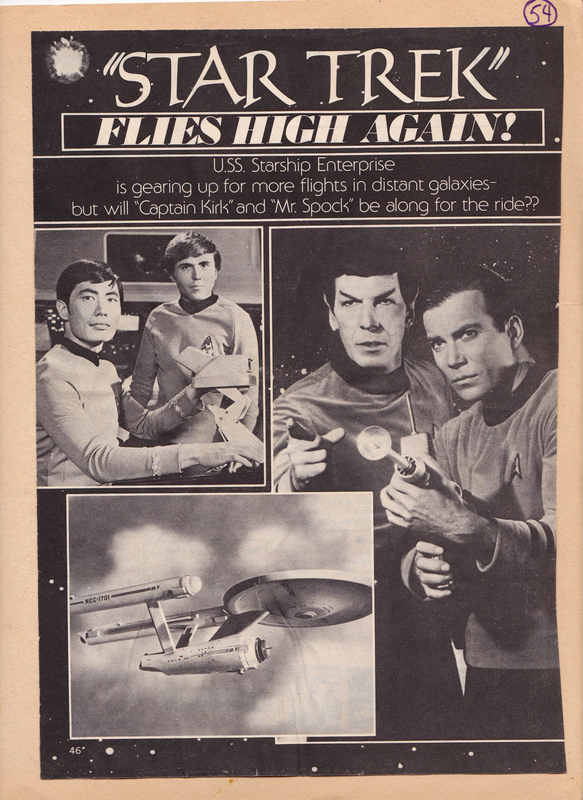 article from a 1977 movie magazine, (Probably TV Radio Mirror) raving about the Star Trek revival, this time asking if Nimoy and Shatner would be along for the ride. At the time I thought it would never really be Trek without Mr. Spock, and millions agreed. A lot of great stills here (if some are backward, which always happened in these pieces) The commentary is definitely of the era, with commentary mentioning Hank Aaron, M*A*S*H, and Fonzie. It appears the writer of the piece had a ball writing this; he or she must have subtly influenced my own style of prose, as it is very giddy with a lot of parenthesis and exclamations, and silly captions! 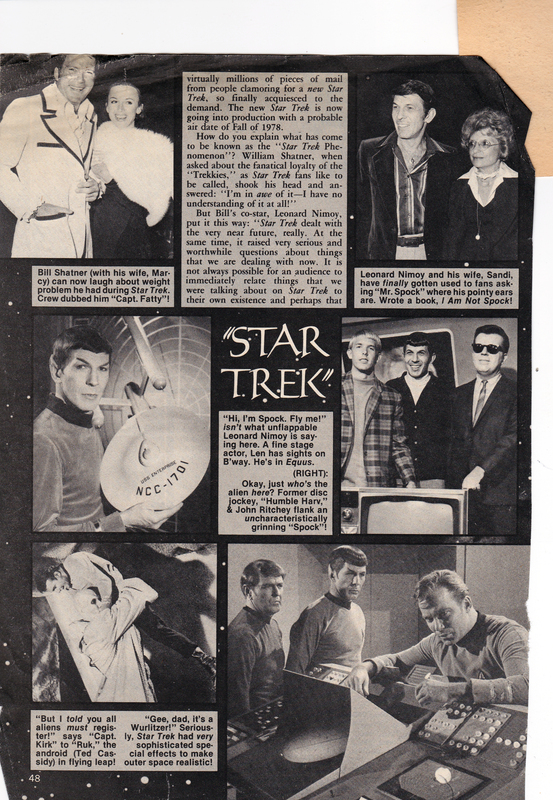 I remember liking how it described Nimoy as ‘darkly good-looking’. Must have read it a hundred times. 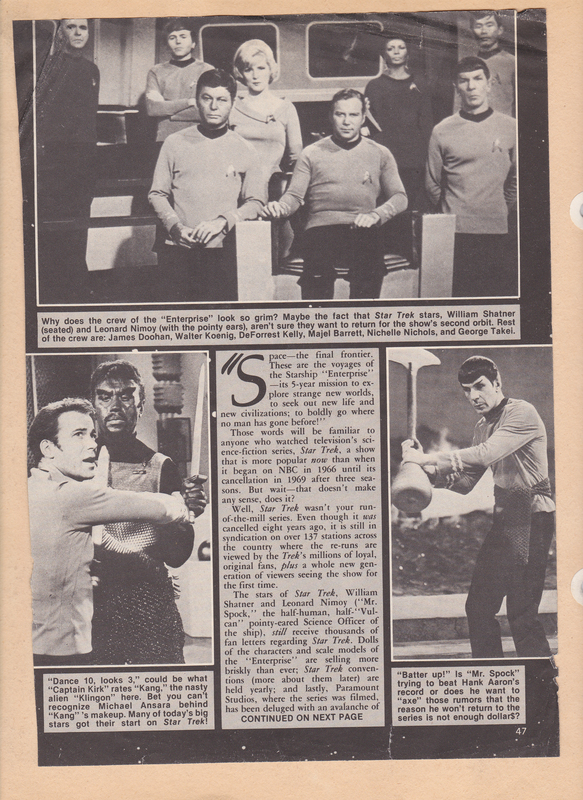 I think that I was happy that a ‘major’ magazine was taking Trek seriously. But I just can’t take Shatner seriously in that white prom tux and super collar!